Dr. Lane Murray Unit is a medium high security prison located in Gatesville Texas, part of Coryell County. The facility is named after Dr. Lane Murray a former school superintendent for the Department of Corrections. Dr. Lane Murray was the originator of a rehabilitation approach through educating inmates, and developed one of the most successfully recognized correctional education programs in the United States. Murray Unit is currently an all female prison that houses up to 1,341 offenders who range from G1 minimum custody to G4 medium/high custody. 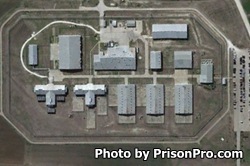 Situated on 1,317 acres, Murray Unit is comprised of thirteen buildings that sit within the secure perimeter. Offenders housing consists of a split level dormitory (F) that has four pods and three single level dormitories, that have two pods in each (named K1, K2, and K3). Additionally, Murray Unit houses inmates in two split level buildings (J1 and J2) which each contain three pods. J2 contains single cells and is where maximum security inmates, administrative detention, transient and pre-hearing offenders are housed. The facility is secured by armed mobile patrols, 154 security cameras, and razor wire fences. Murray Unit is co-located with Crain, Woodman and Hilltop Unit and shares many of the agricultural based operations with these other facilities. Some inmates can work in farming edible crops, caring for security dogs and horses, and in the production of pork. Vocational programs offered at Murray Unit include a tourism and hospitality program. Academic opportunities available to offenders include literacy courses, adult basic education and GED classes, substance abuse education, parenting/life skills courses, and pre-release preparation. Inmates at Murray Unit have access to mental health services as well as off site medical and dental care. Inmates who are currently serving time in the Murray Unit are allowed visits on Saturdays and Sundays from 8am to 5pm. All visitors must be on the inmate's approved visitation list prior to attending a visiting session. Offenders are allowed one visit per weekend, either on Saturday or Sunday. Visits are a maximum of two hours in duration unless you are traveling over 300 miles and have been granted a special visit through the Warden's office. Visitors are allowed to bring a small clear Ziploc bag with up to $20 in quarters with them, these funds can be used to purchase items from the vending machines.